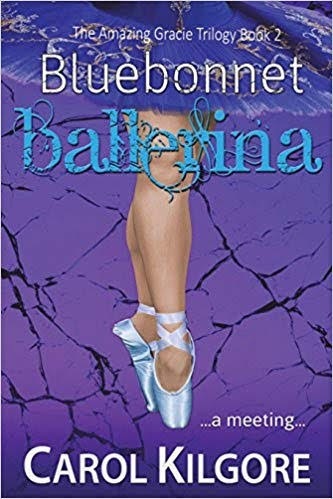 Thank you for joining us on the Virtual Book Tour for Bluebonnet Ballerina, a Mystery and Romance by Carol Kilgore (19 June 2018, Carol Kilgore, 265 pages). This is the second book in the The Amazing Gracie Trilogy series. PREVIEW: Check out the book's synopsis and the Kindle Cloud Reader Preview below. Bluebonnet Ballerina is FREE on Kindle Unlimited and Kindle Owner's Lending Library. Author Carol Kilgore will be awarding a $50 Amazon/BN gift card to a randomly drawn winner via Rafflecopter during the tour. Please do take part: comment on our post and follow the tour where you will be able to read other excerpts (☀). Gracie Hofner returns, and chaos reigns—including a couple of ghosts trying to save their granddaughter. But as Gracie dances from problem to problem, she’s unaware the music has been orchestrated into a murderous symphony. When a different melody reaches Gracie’s ears from a guitar played by the new tenant living in her garage apartment, her tension vanishes. She listens unseen, cocooned in the shadows on her patio, and wonders who he’s longing for—and how it would feel for a man to crave her that much. She can’t dwell on those thoughts, however. Problems of murder and missing prisoners abound. To say nothing of the ghosts. No one ever said being a law enforcement consultant would be easy. Gracie Hofner dances in the face of danger during a San Antonio crime wave - but there are also a couple of ghosts to deal with in this second book in The Amazing Gracie Trilogy. Click on the book cover to Look Inside the book on Amazon and read an excerpt. A hot and spicy taste of murder—and beyond. Law enforcement consultant Gracie Hofner is assigned to a trendy San Antonio pastry shop to watch for a delivery. In addition to the intoxicating aromas of sugar and chocolate, she also has to fight her own attraction to the man working beside her, Donovan Beck. He’s a hunk and a half and perfect for a spring fling. If she had more time, Donovan would rank higher on her to-do list. But the number one spot is occupied by her search for a missing little girl, the target of a killer. Gracie needs to find her pronto, and the odd super-instinct quirk that’s started plaguing her may help. If not, she can always see what happens if it tells her to buy a lottery ticket. 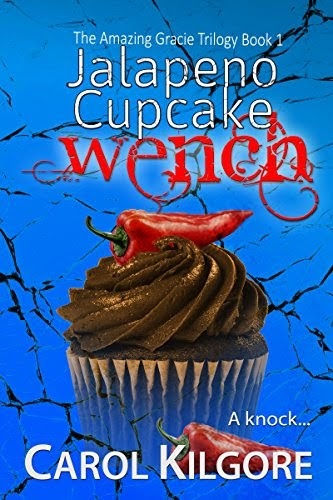 Jalapeno Cupcake Wench is the first book in The Amazing Gracie Trilogy, a story so big, it takes three books to tell it. 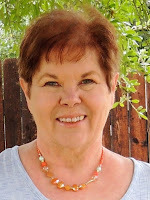 Carol Kilgore is the award-winning author of The Amazing Gracie Trilogy. In addition, she is the author of In Name Only, Solomon’s Compass, and Secrets of Honor, three standalone romantic suspense novels set along the Texas Gulf Coast. She and her husband live in San Antonio, the setting for the Amazing Gracie books, with two quirky herding dogs who still require help opening the food bin and the door. You can learn more about Carol and be the first to know when the third book in the Amazing Gracie Trilogy will be released by visiting her website and subscribing to her newsletter. Remember to comment to win! Thank you for hosting me! I'm happy to be here and will be around to respond to comments. Yes! I'm working on the fourth Gracie book now, and the trilogy will become the first part of the Gracie and Friends Series. The book is still in the thinking stage, and it will be a standalone book in the series. I hope to begin writing before too much longer. BooksChatter Reviews by http://bookschatter.blogspot.com is licensed under a Creative Commons Attribution-NonCommercial-ShareAlike 4.0 International License. 2013-2019 BooksChatter . Powered by Blogger.